Developing entrance flows are of interest in a large number of application areas. They have been widely studied in the past, but many aspects of these flows are not yet fully understood. One of the questions concerns the stability and turbulent transition in the entrance region of a channel. The present study investigates by direct numerical simulation (DNS) the laminar–turbulent transition induced by boundary layer interaction in a spatially developing flow near the entrance of a channel, where the laminar flow is linearly stable. For uniform inlet flow conditions and at sufficiently high Reynolds number, the turbulent transition actually takes place inside the boundary layers and well before the fully developed regime. The transition of one of the two boundary layers is triggered near the entry section by small amplitude perturbations, such as the ones created by small isolated obstacles distributed on the wall. These generate elongated streaks, and their transient growth and breakdown lead to the turbulent transition of the boundary layer near the entrance region. The transition of the second boundary layer is induced by the interaction with the first further downstream. After the transition of the second boundary layer, turbulence occupies the whole channel width and a turbulent channel flow develops. The transition is analyzed with the help of an orthogonal decomposition of the solenoidal velocity field. The observed transition scenario differs from existing simulations of streak breakdown where the perturbation is optimized for a transition to occur in a region far away from the entry section. In our simulations, the perturbation setup generates a significant nonlinear growth of the streaks that are pushed away from the wall. Transient varicose instabilities, followed by sinuous instabilities induce the development of mushroom-shaped transitional structures in the outer region of the laminar boundary layer, that further break down downstream. 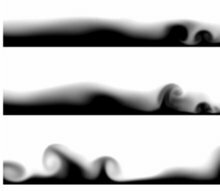 The second boundary-layer transition resembles the one occurring under free-stream turbulence, with the generation of finite-length streaks and turbulent spots.